Hey everyone! We’ve been busy working on this year’s Christmas decor around the farm. We’re excited about some new things for 2016. 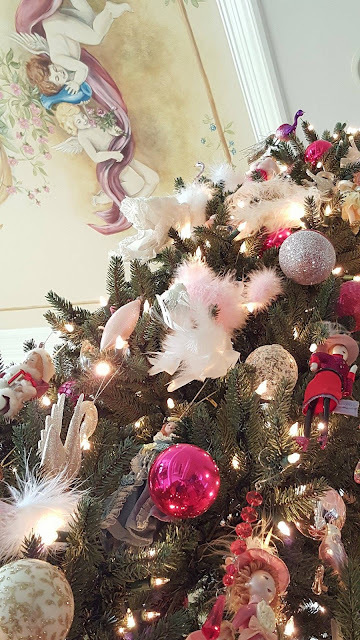 In the meantime, let’s take a mini tour of the house decor from 2015. Hope you will enjoy it and who knows? Maybe you will have a little inspiration! Let’s start through the front door! 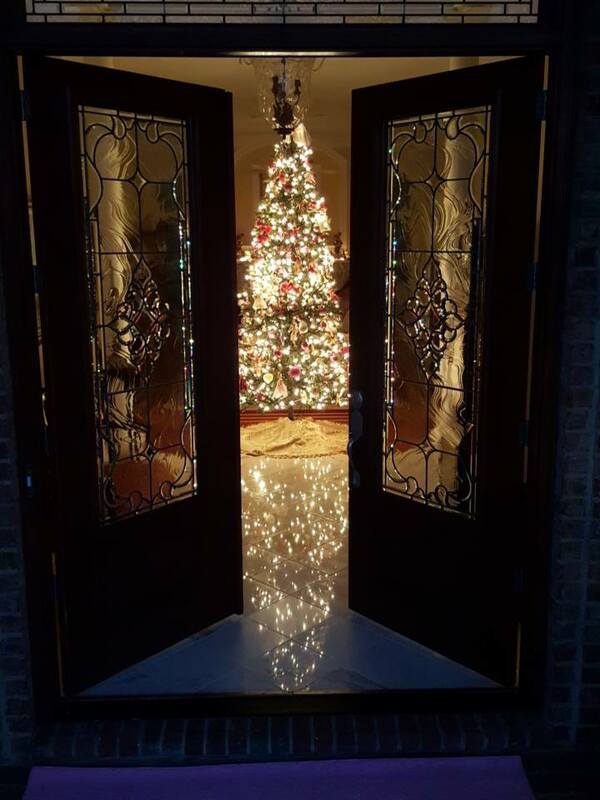 As you enter the front door, and step into the foyer, the first thing you see is the living room tree. I love having the tree here. 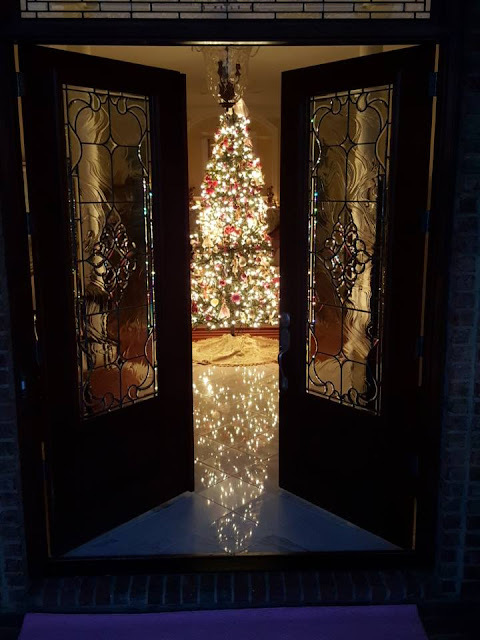 It looks pretty through the leaded glass doors at night! As you pass down the street, it looks like it is sparkling! You can also see the tree from the dining room and study. It’s nice to see it while we share our Christmas Eve dinner. 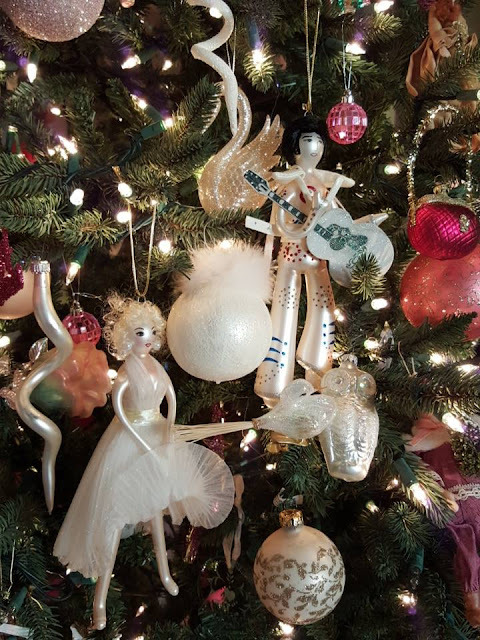 This tree is decorated with an assortment of ornaments. I used ornaments in different shades of pink, greens, blues and golds. Most of them I have had for years. The walls in this room are pale gold, and the Aubusson needlepoint rugs are off white with floral bouquets in all of these colors. The ceiling of the foyer has a handpainted scene with cherubs and florals. 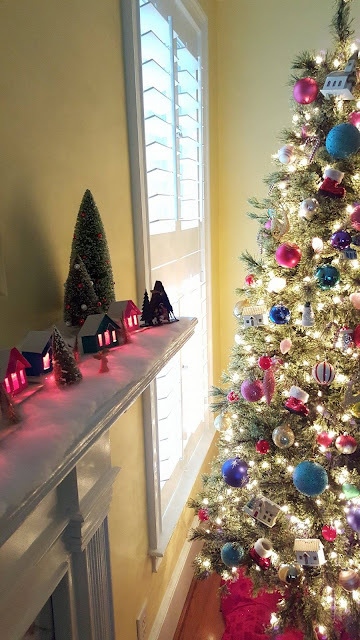 None of my trees actually have a theme. I’ve just enjoyed collecting ornaments that are interesting and that I love, and also that go with the color scheme of the room. Since this tree is in the formal part of the home, it is decorated in an elegant, almost Victorian style. I have vintage Victorian furniture in the living room. To the left of the foyer is the study, let’s visit this room. Actually this room is a study, library and guest bedroom. 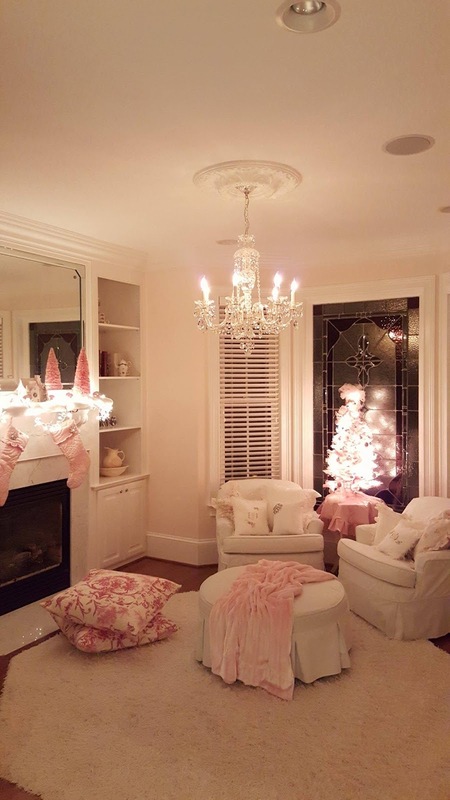 This room is also done in pinks and greens. This little tabletop tree gives this room a cozy, and welcoming glow. 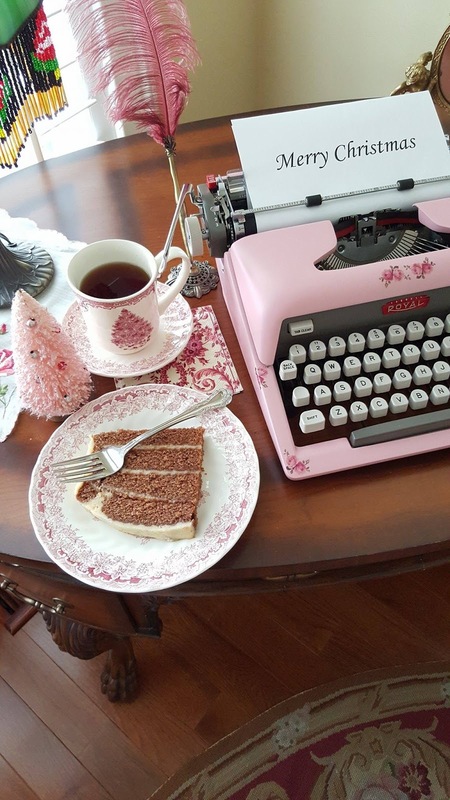 I have it decorated in pretty pink vintage ornaments. 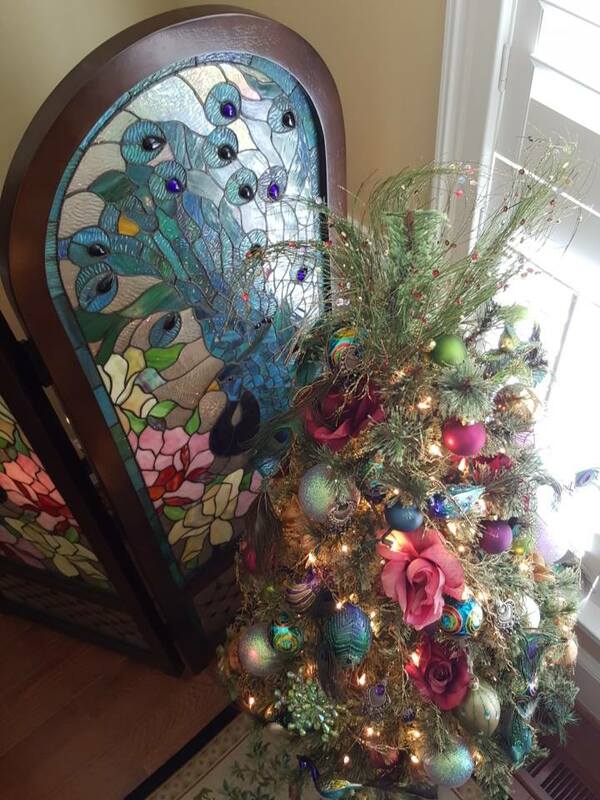 In Victorian times, you would often see these tabletop trees in decor. On this ladies writing desk, I have a vintage pink typewriter. I enjoy decorating around it for the different seasons. This was taken on a day that I made our family recipe of Brownstone Front Cake. To the right of the foyer is the dining room. This room is what I call Old World style. I fell in love with these toile parsons’s chairs done in this Bosporus fabric. 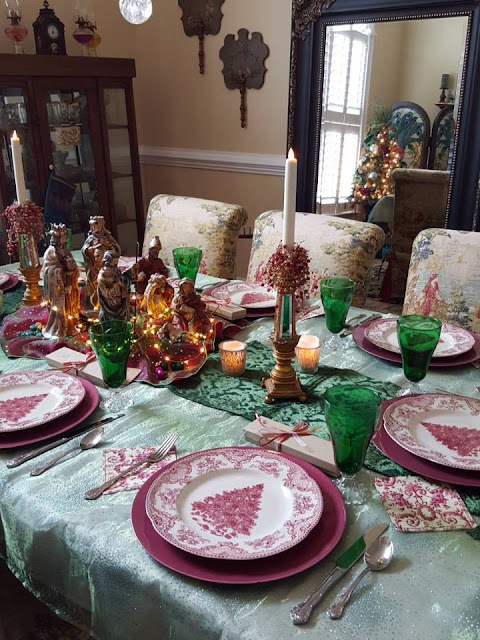 This is the tablescape that I used during Christmas and during our annual Christmas Eve dinner. The plates are from Johnson Brothers and called Old Britain Castles. I use them every year. This nativity set is I always used as a centerpiece. 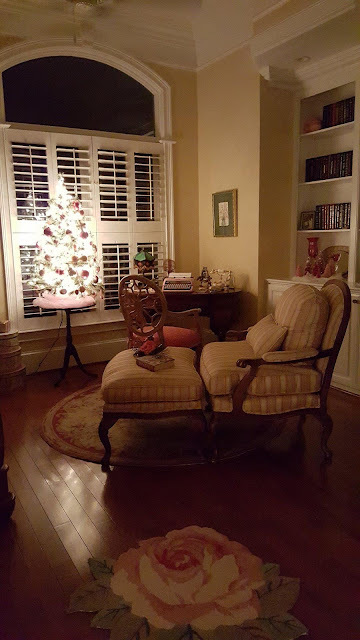 The tree in this room is actually one normally used on the front porch or patio. I decorated it in colors that I pulled from the chairs and needlepoint rug. There are peacocks and florals in the rug in beautiful jewel tones of teal, turquoise, reds, greens and golds. The next room you will see is the sitting area of the master bedroom. This room is simply decorated with two white slipcovered club chairs, ottoman, and white shag area rug. As you can see, there are also touches of pink. 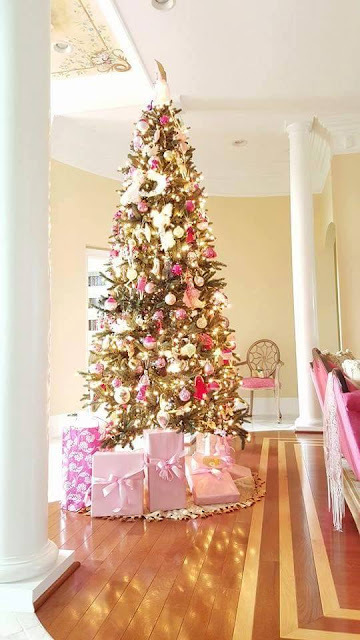 Here, I have another pink tabletop tree. The mantel is covered with a white snow blanket and lights hidden underneath for a winter scene. Bottle brush trees, a little glittered coach with horse and glittered cottage gives the mantel a dreamy, storybook look. My bed is covered with a white matelasse bedspread and shams. I found the pink and white toile, european pillow shams, years ago and just had to have them! I think they look so elegant. 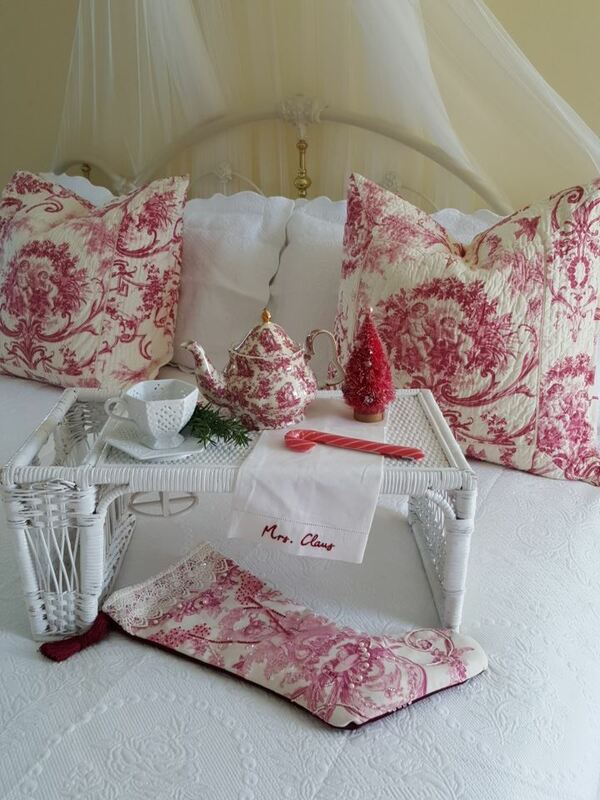 To complete the look, I have these beautiful toile stockings displayed in this room. 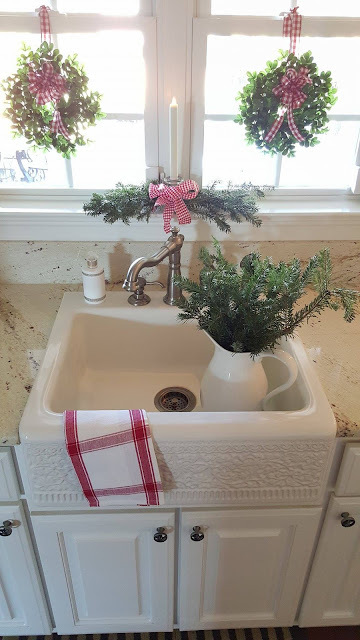 This is a picture of my farmhouse apron sink decorated in simple greens and gingham ribbon. I think this sink is one of the focal points in my kitchen. 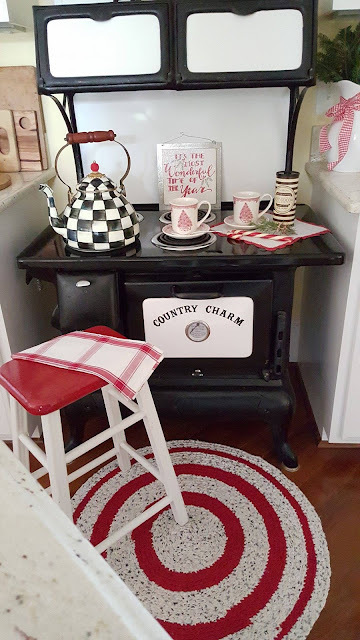 Another focal point in my kitchen is my Country Charm Stove, one of my favorite pieces in my home. It is cast iron with a porcelain top. It is a reproduction of an old wood cook stove, electrified. This little lady has served our family well for many years. Our final room on the tour today is the family room. This is where the family gathers. As you can see this is a bright and cheerful space. Yellow! 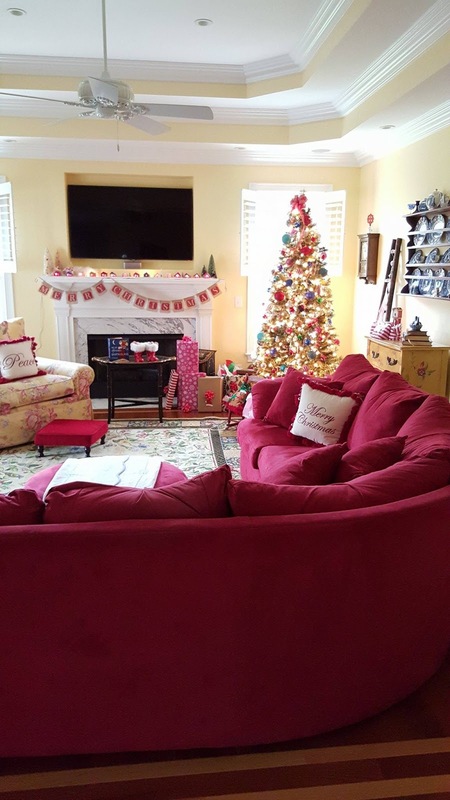 The tree in this room is decorated in an assortment of ornaments that coordinate with the colors from these two comfy chairs and the needlepoint rug. This is a room where we can all relax and hang out. 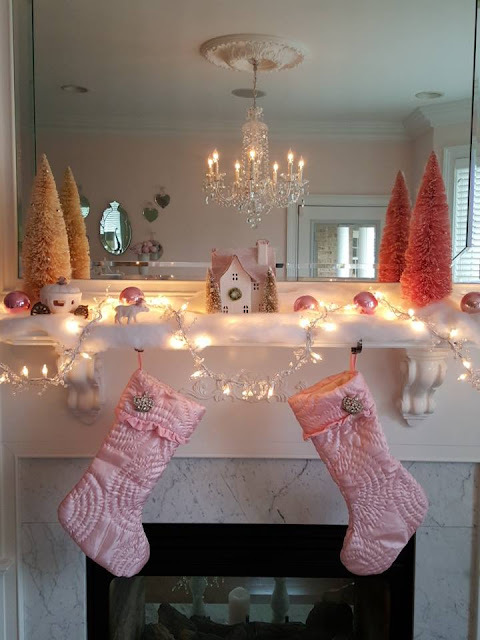 The mantel in this room is decorated with a vintage, glittered, putz village that we have had in the family since I was a little girl. It is just magical! My mother used to place it underneath the Christmas tree. I would sit and stare at it for hours, letting my imagination travel to Christmases long ago. I hope you enjoyed our little Christmas tour 2015!. 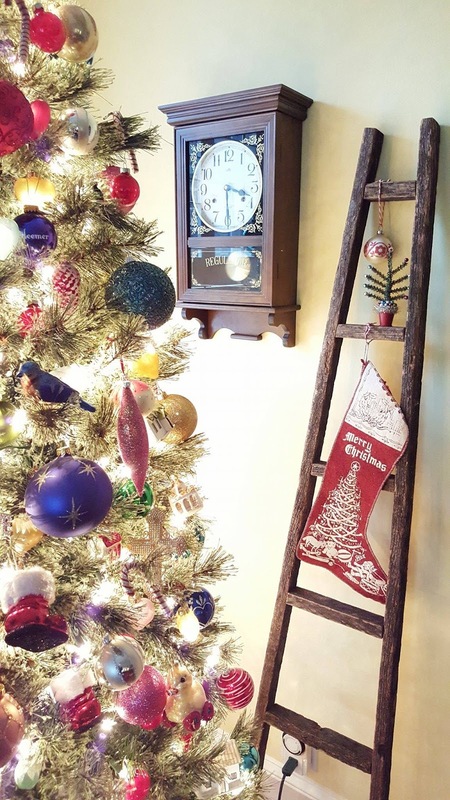 We’re excited for Christmas 2016! We have done some new things this year and I can’t wait to share! Hope you will check back to see!